file. Michael D. O'Connor, author. 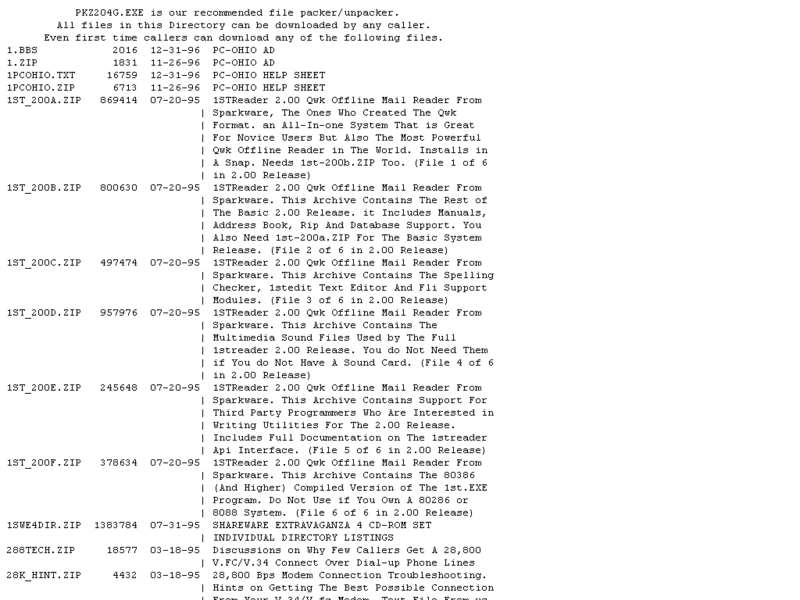 Scripts for use with Robocomm 4.1 or greater for connecting to a BBS running TriBBS software. Written and tested on TriBBS version 5.0 by author. are specifically designed for the BBS using the TriBBS software version 5.0.
for them to work properly. are no QWK messages to receive. The script will correctly answer "N"
QWK packet, saving you telephone costs. NOTE: In order to use these scripts, Robocomm 4.1 or later is required. NOTE: The scripts were tested on a BBS loaded with TriBBS version 5.0.
super expert. Do not set the mode to super expert mode. For best results, set to expert mode. To do this, press "X"
CAPTURE in the TLOGON.RS script. On the same line is the word OVERWRITE. Replace this word with APPEND. %ID% identifies the BBS ID of the currently connected BBS. appends to the previously closed capture file instead of overwriting it. The CLOSE command closes the capture file. to the capture file indicating a capture file opened for capture. capture file will show only the progress of the TLOGON script. user-specific personal data at log-off time. %ID% - Translated to the BBS ID of the currently connected BBS. Configure/Data & Logs menu in Robocomm for mail packets. Configure/Data & Logs menu in Robocomm for outgoing replies. Configure/Data & Logs menu in Robocomm for file downloads. Configure/Data & Logs menu in Robocomm for file uploads. a drop carrier if the script sits idle on a BBS prompt without responding. This will let you sleep while Robocomm runs the scripts. The following section describes script operation for each script. menu in Robocomm is entered. previous QWK files from QWK to QW1, QW1 to QW2, and so on, up to 9.
displayed in Robocomm's message window saying "No Reply Packet to Send." whereupon the next script in line gets executed. "No QWK Messages to Receive"
"No Reply Packet to Send"
"Both parameters must be entered in script"
the script will bypass the section which handles the other input parameter. The script includes an option to send an upload file to the Sysop only. See the next section "How to Load the Scripts in the Agenda in Robocomm"
under "Loading TFILE.RS" for more information. and/or DESC.SDI, and to include these files inside your archive. the section "FILE_ID.DIZ and DESC.SDI" at the bottom of this file. capture the user-specific personal data at log-off time. there's no need to delete a loaded script and re-load it when you need to. carefully programmed to work together with TLOGON and especially TLOGOFF. command to determine the relationship between two strings. re-edited for files to upload and/or download everytime it is used. short one which logs onto the BBS you're calling. PARAMETER 1 "Where is TriMail Located (M or D)?" PARAMETER 2 "What command starts TriMail?" result in these questions being prompted for your parameters. "Where is TriMail located (M or D)?" TriMail is located in the Door menu, so enter "D". at any time by highlighting the agenda item and pressing Alt-P.
the script will not execute properly. PARAMETER 1 "Filename to Download (no path):"
PARAMETER 2 "Filename to Upload (no path):"
PARAMETER 3 "Send file to Sysop only? (Y/No entry):"
Parameters 1 and 2 should contain only the filename with no path. error message to Robocomm's message window, and move on. If there is no file to upload, leave this entry blank. blank if sending it for public posting. see the section below on "FILE_ID.DIZ and DESC.SDI." last script in the agenda. include the USING parameters specifying "ROBORZ" and "ROBOSZ", respectively. DSZ.COM (or DSZ.EXE). I don't think it's provided with Robocomm. UPLOAD script commands. How to do this is shown below. As it is now, the script will run using Robocomm's internal protocol engine. This will result in the use of the external protocol engine in Robocomm. In BYTELINE BBS, either method will work. or in the same directory where Robocomm is. Zmodem in the BBS you're calling. This section explains how to do this. The text area should be no more than 10 lines long by 45 characters wide. read the included short DIZGEN.DOC file. scripts. Use them at your own risk. Michael D. O'Connor, author of QwkStor, Inventrol, Accounter, and Power.